OHSAS 18001:2007 represents a work model for the organizations willing to ensure a better control of the professional risks. It has been developed in scope of completing the quality and environmental management systems and it is based on explicit requirements for better managing the professional risks and inducing a culture for prevention among employees. RENAR - The national accreditation body (Certificate SM 004) in compliance with OHSAS 18001:2007 reference standard. SRAC certifications are recognized at an international level through SRAC partnership in IQNet (The International Certification Network). 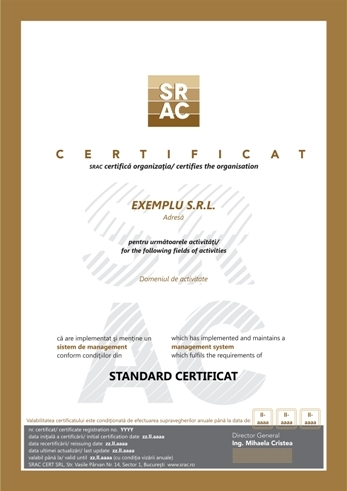 To that extent, the organizations certified by SRAC receive, together with SRAC Certificate, also the IQNet Certificate, without any additional costs. regularly informed on the evolutions in the occupational health and safety and certification areas, by accessing SRAC website, events organized by SRAC. In the modern society, promoting the health and safety conditions in the workplace and ensuring a comfortable work environment, observing the normative requirements and maintaining a good business reputation are key aspects which should be considered by every successful organization. The implementation and certification of a occupational health and safety management system is an effective tool for organizing and focusing the efforts of an organization towards a better control and management of the work-hazards (accidents, incidents and occupational diseases) and a significant improvement of the professional performances. Do you want to know the costs of certification? Complete the online INQUIRY and you will receive our answer in the shortest time possible.